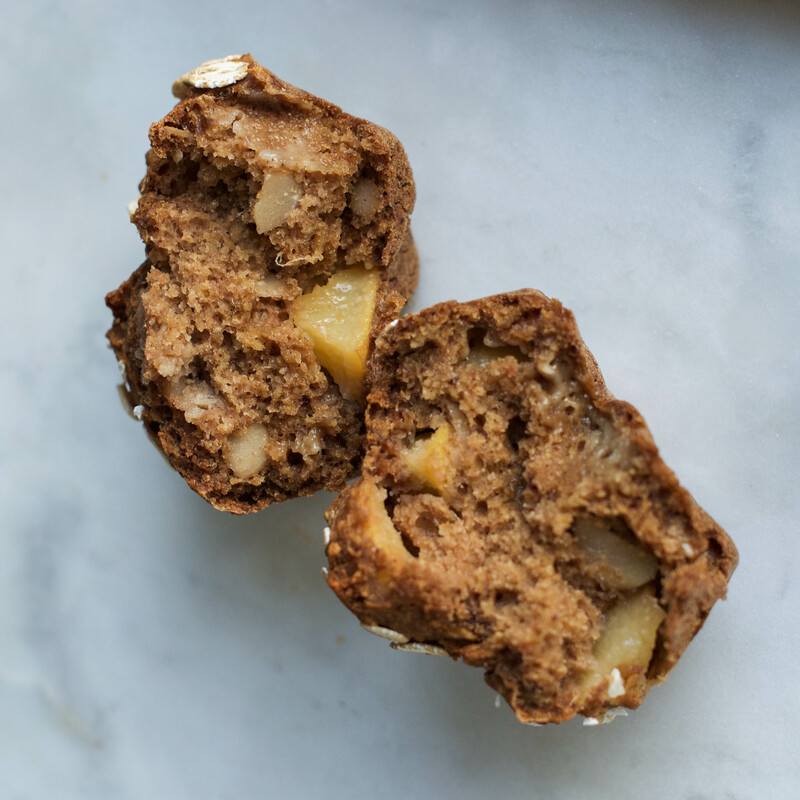 These Apple and Cinnamon Muffins are vegan, gluten-free, oil-free, and full of flavors ! Enjoy them for a nice afternoon snack paired with a hot cup of tea, or on the go. Cinnamon is one of those spices that are just so warming and that I love to sprinkle everywhere, especially in winter. To me, it adds so much flavor that even when it’s just paired with apple slices, it makes it taste like dessert. I think I got this love for cinnamon from my Mom, who always adds a TON (and I really mean a ton) of cinnamon to her daily homemade apple compote. Basically like a mountain of cinnamon with a touch of apple compote. I used to find this crazy, but now I get it, and cinnamon has become a staple for me. I love combining it with apples too ! Now, onto the muffins ! 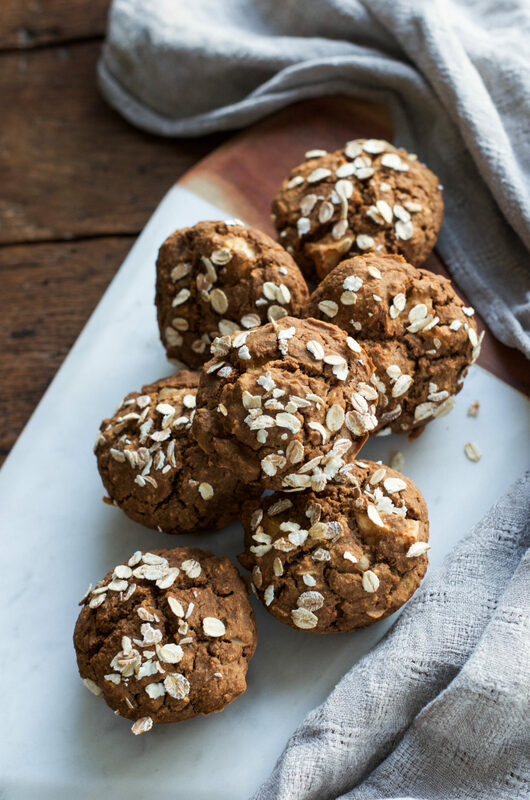 Since I think that the apple & cinnamon combo is one of the best combos, and that everybody loves muffins, why not make vegan Apple and Cinnamon Muffins ? Doesn’t that just sound delicious ? I love how the apples add a nice sweetness and moisture to the muffins. 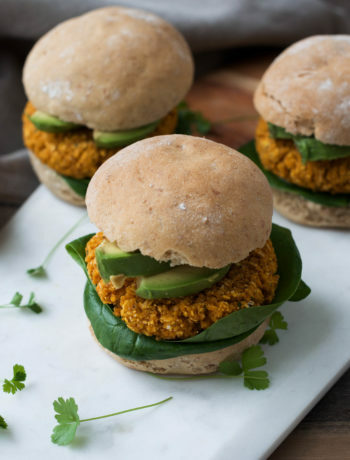 These muffins are best fresh, but you could also heat them up a little bit in a toaster oven or in a regular oven, if you can’t eat them all at once ! They freeze well too. You can just store them in an airtight container, put them in the freezer. When you want to eat the muffins, just take them out, let them thaw for at least 30 minutes and then heat them up for a couple of minutes (trust me, it makes all the difference!). 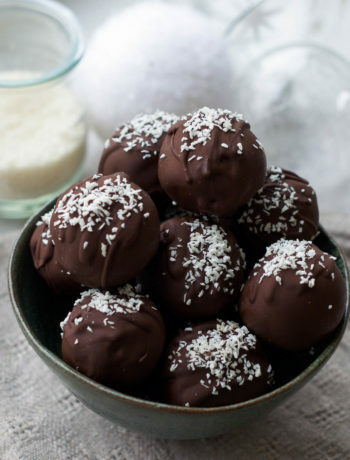 I bet these would also taste amazing slathered with some nut butter too ! Remove the pits from the dates, and soak them in warm water for 15 to 20 minutes. 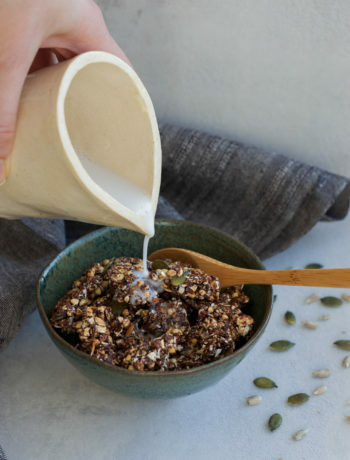 Prepare the flax egg by combining together the ground flax seeds and water. Stir and set aside for 15 minutes. Drain the dates, chop them roughly with a knife, and then mash them up with a fork. Preheat the oven to 180°C (350F). 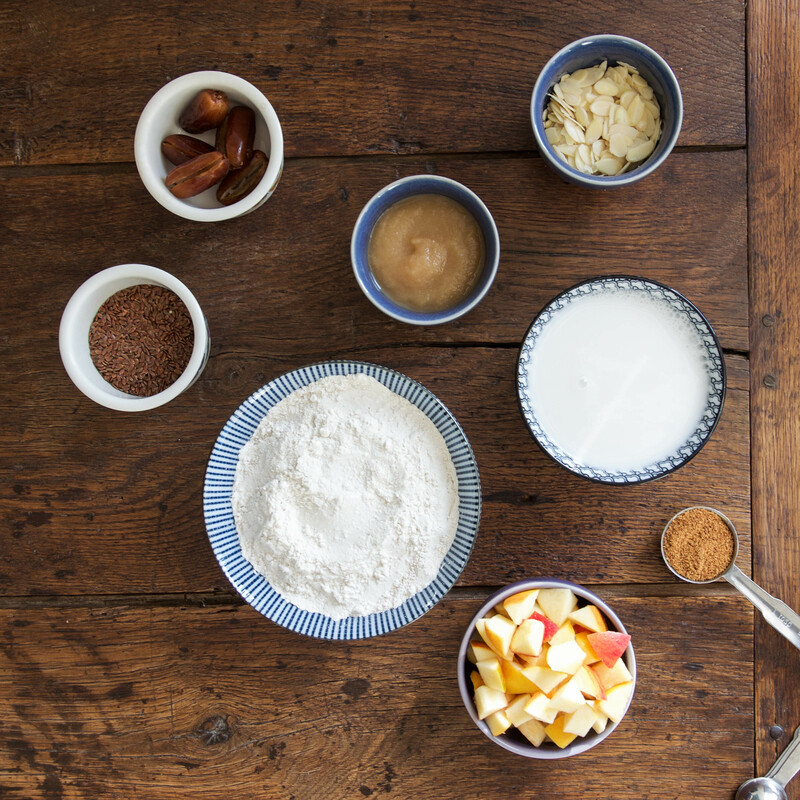 In a large mixing bowl, mix together the dry ingredients: oat flour, brown rice flour, baking soda, baking powder, cinnamon, vanilla, almonds and coconut sugar. In another bowl, mix together the wet ingredients except the diced apples: apple sauce, lemon juice, almond milk, as well as the flax egg and mashed dates. Pour the wet mixture into the dry and stir to combine. Don't over mix to avoid gummy muffins ! Gently fold in the diced apples. Scoop the batter into a silicon muffin pan or greased regular muffin pan. You should get between 9 and 11 muffins, depending on your pan. Optional: sprinkle some rolled oats on top of the muffins. Bake at 180°C (350F) for 30-40 minutes, until golden brown on the top or until a toothpick comes out clean. Remove the pan from the oven, and let cool for at least 15 minutes before removing them from the pan. You can enjoy them warm if desired ! 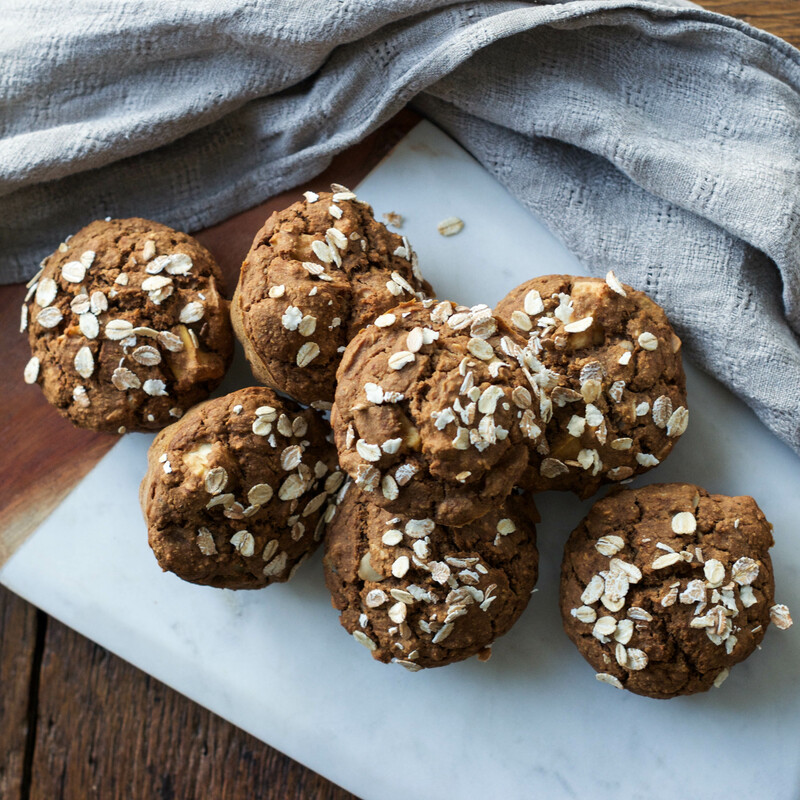 * Simply use a blender to make your own oat flour with rolled oats ! They should form a fine flour (blend a little longer if it's too grainy).